The St. Baldrick's Foundation is a volunteer-powered charity dedicated to raising money for lifesaving childhood cancer research and funds more in childhood cancer grants than any organization except for the U.S. government. 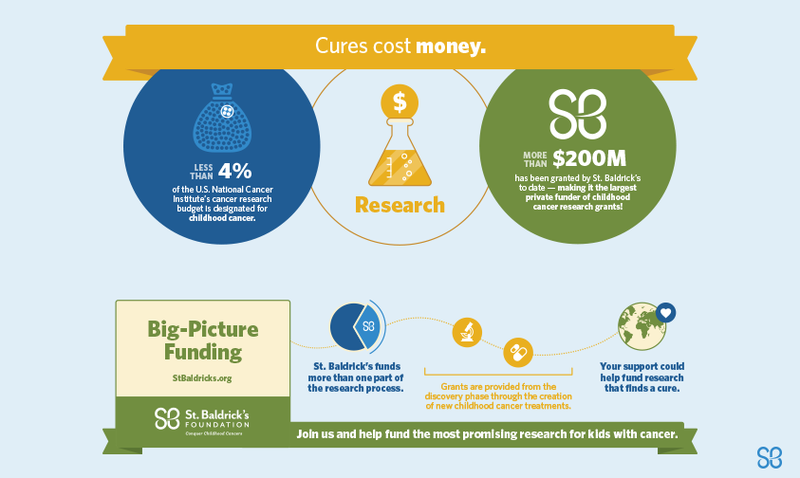 To date, St. Baldrick's has funded more than $230 million to support the most brilliant childhood cancer research experts in the world. Worldwide, 300,000 children are diagnosed with cancer each year. And in the U.S., more children die of childhood cancer than any other disease - more than AIDS, asthma, cystic fibrosis, congenital anomalies and diabetes combined. ST. BALDRICK’S EXISTS TO CHANGE THESE REALITIES! By working closely with leading pediatric oncologists, we determine the most promising research to fund and create funding priorities to make the greatest impact for children with cancer. The St. Baldrick’s Foundation is volunteer-powered—from the founders who started it all to the volunteer who signed up today. You are the reason that the St. Baldrick’s Foundation can fund more grants than any organization besides the U.S. government. So get involved!